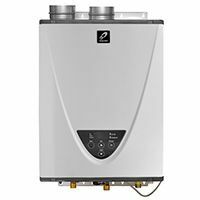 Gas and electric, tankless and storage type hot water heaters for residential and commercial applications from the best brands in the industry. Gas and electric tankless (also know as "on-demand" or "instantaneous") hot water heaters in propane and natural gas. Standard and high-efficiency gas and electric storage tank type water heaters in all common capacities from 10 to 100 gallons. Single-coil and dual coil, standard (glass-coated) and stainless steel tank indirect hot water heaters in capacities from 20 to 100+ gallons. 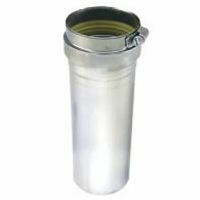 Category III stainless steel and polypropylene (PP) vent pipe and accessories for condensing and non-condensing water heaters. 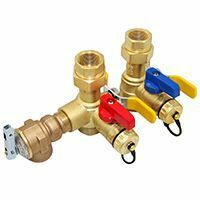 Isolation valve kits for easy installation and maintenance of gas and electric tankless water heaters. 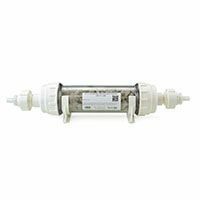 Neutralizer kits and replacement media for condensate management in gas condensing hot water heaters. 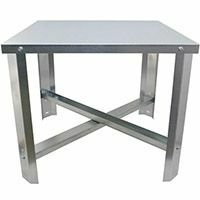 Durable and easy-to-assemble steel stands for tank-type water heaters with up to 100-gallon capacity. KJr2, K4, D2, H3 & M50 series Takagi gas (LP and NG) condensing & non-condensing tankless water heaters for indoor & outdoor use. 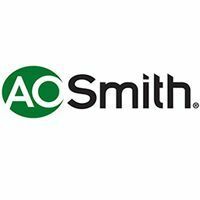 ProLine, Proline XE, Vertex, Effex, Voltex & other series gas and electric storage tank type residential water heaters by AO Smith. 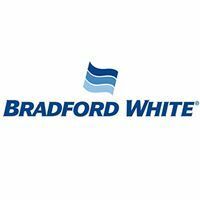 Full range of gas, electric and indirect storage type hot water heaters from Bradford White, including Defender series. 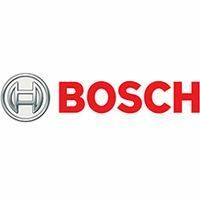 Complete line-up of Bosch gas & electric tankless (Therm, Greentherm and Tronic series) and indirect type hot waters. 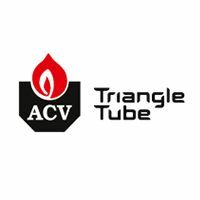 Comfort and Smart series tank-in-tank type indirect hot water heaters by ACV (Triangle Tube) in all sizes. Tankless water heaters (TWH) - also known as "on-demand", provide hot water whenever a hot water tap is opened. As the name suggests, they do not incorporate a tank and instead use a coil which heats up the water instantaneously as it passes through. Tank (storage) type water heaters - includes small (mini-tank), medium (utility) and large (standard 30, 40, 50, 75-gal, etc.) units which heat and store the domestic hot water in the tank. This category includes many varieties, including gas-only, electric-only, hybrid (heat-pump), solar booster types and others. Indirect water heaters - are storage tanks with built in heat exchanger coil(s) which use the hot water produced by the boiler, solar system or other heat source to heat domestic water. Increased energy efficiency - tank-less (no tank) means no energy required to heat the water when not in use and no standby heat loss. Tankless efficiency can be as high as 95-99% in condensing gas and electric models, whereas regular storage water heater is usually below 70% efficiency. Instant hot water - eliminates waiting which happens with storage type units when the hot water in the tank is used up. Consistent hot water output temperature - means that hot water temperature remains constant regardless of how long it is used. With storage type water heaters, if usage (GPM) is greater than the recovery rate, then hot water temperature will be gradually dropping until the unit is allowed to fully recover. Compact design - takes up less space and allows to install the water heater in confined spaces. Less flooding concerns - storage tank water heaters may leak, and if they do (even with a flood prevention shut-off valve installed), all the tank contents may end up on the floor, causing significant property damages. Limited GPM capacity - means that the TWH unit can only produce so much hot water at any given moment. With storage type heaters, the hot water output is virtually unlimited (until used up), regardless of how many fixtures are used at the same time. For tankless, this may present a problem where too much hot water is used at once (i.e. one person taking a shower, second washing hands, third does the dishes all the while the washing machine is running). The best way to prevent this from happening is to properly size the tankless unit with consideration to temperature rise (diff. between incoming cold water and outgoing hot water T°) and usage needs (GPM flow). Higher price of a tankless unit means a larger up-front investment. Minimum activation flow rate (usually 0.5-0.75 GPM) - requires a minimal flow through the TWH in order to activate and start heating the water. While not an issue under normal conditions, it may be a nuisance when only a trickle of hot water is needed. Indirect hot water heaters are a great solution where fuel choices are limited (i.e. solar, geothermal, oil or wood pellets), as they use hot water produced by the heating system to heat up domestic water and do not require a separate fuel source on their own.